If Israel`s parliament approves the proposal, 30,000 Bedouins could be removed from their homes in the Naqab within 60 days. 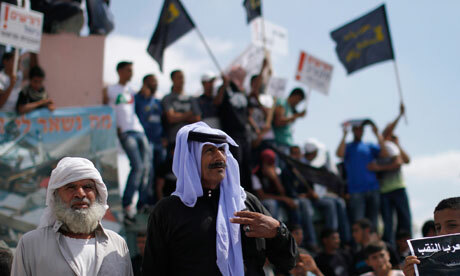 Phoebe Greenwood, The Guardian Six Arab-Israeli towns in Israel`s southern Naqab (Negev) region have ground to a halt in protest at government plans to confiscate swaths of land from the Bedouin community. If the proposal passes through the Knesset, Israel`s parliament, unopposed, 30,000 people could be forced from their homes within 60 days. Schools, shops and municipal offices across the region closed for the day allowing more than 8,000 people to stage a demonstration in Beersheba rejecting the plan, the largest civil protest in the city`s history. Arab-Israeli MP Jamal Zahalka said they were united against the proposal. We want to send a very clear message to the Israeli government. We are saying no. This demonstration proves that Israel`s plans will be thwarted. Nobody here today will cooperate with them. He added that the protesters would not allow another Nakba, the Palestinian term for the events of 1948, in which hundreds of thousands became refugees. The Israeli ministerial committee approved a plan to settle the long-standing land dispute between the Bedouin communities in the Naqab and Israel on 11 September. Based on a report produced for the prime minister`s office, it suggests that more than 30,000 Bedouin living on land claimed by Israel should be resettled in six towns created and recognised by the state in 1973. Of the 12,000 sq km (2,965,000 acres) of Naqab land, the government plan apportions 200 to the Bedouin, with compensation offered to anyone forced from land they can prove ownership of. Around half of the Naqab`s 180,00 Bedouin live in unrecognised villages, without running water, electricity or public services of any kind. They are the poorest minority group in Israel. Mark Regev, spokesman for Israel`s prime minister, Binyamin Netanyahu, said the aim of the government was to assist the Bedouin minority by assimilating them into wider Israeli society. The Bedouin community has a lower standard of health care and education than the rest of Israel, they live in substandard conditions. We are investing 1.2bn shekels [£210m] to move them into the mainstream, to reduce that gap. The idea that the Bedouin do not want to make this move is simply not true. 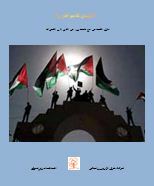 Bedouin leader Amal al-Sana al-Hujuj said the report failed to recognise Bedouin claims to the land prior to the creation of Israel, as recommended by the government-commissioned Goldberg committee in 2008. An estimated 90,000 Bedouin lived in the Naqab before 1948. If we accept what they are offering, we will see a violent, over-crowded poverty-ridden area, she said. We want to restart the negotiating process so we the Bedouin can start to contribute to the area and not just be people living in poverty.